womenforfootball.com- Toronto soccer fans have yet to find out why their Toronto-based MLS team’s general manager have approached a current player as their next manager. Forget about not having previous “Canadian experience” usually Canadian employers insist on, Ryan Nelsen does not even have a previous coaching experience to help boost the struggling Toronto FC’s performance in upcoming season. 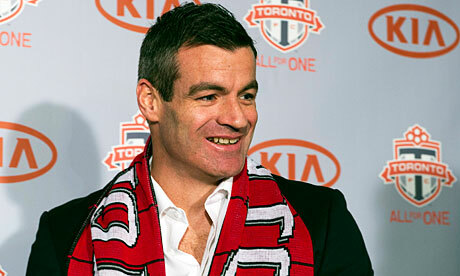 The ironic thing is, Toronto FC’s new manager will play, yes play as a player, for QPR this week against Manchester City! Originally from New Zealand, English Premier League and QPR’s defender, is confirmed to leave QPR squad in the middle of season before starting his first coaching job at Toronto FC on Feb 1st. Honestly, sometimes I like to learn how to hack into Toronto FC’s General managers and directors’ minds for their disappointing coaching appointments they have made over the years. But sadly, or maybe I’m discounting Ryan Nelsen’s capabilities, this is first of its kind in Toronto FC’s history since 2007. Nelsen’s predecessors, even if not entirely a top-notch manager, but at least had previous experience as U-20 coach or as Assistant coach. If they could not satisfy Toronto’s soccerr fans and the club directors, how can a player can? Never before, a current player with zero coaching experience was signed to manage a MLS team mandated to improve their usually dismal performance compared to their competitors. So as a Toronto resident, I can only wish good luck for Toronto FC but highly doubt this season be any different than last season. January 23, 2013 in Club football. Diego Forlan off the radar? ← Pep Guardiola set for Bayern Munich. Why FC Bayern?